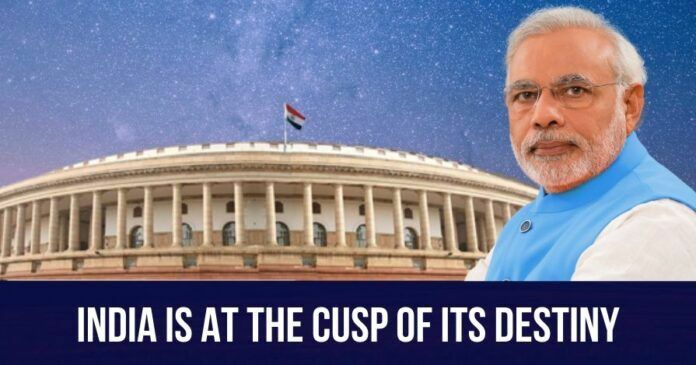 India is at the cusp of its destiny. Providence has presented to us someone who is very passionate about bringing the country forward, to take out of its morass, to care for every person no matter who they are, who is trying to uproot the entrenched systems of entitlement, the modern day kings and Queens and their dynasties, who has taken criticism, insults for no fault of his and dreaming big. Dreaming that no child in the country goes to bed hungry in a country where every second child is malnourished, dreaming every family has a roof on their head when millions live in ramshackle homes in inhumane ghettos, dreaming every household has minimum needs of electricity and water, dreaming every girl child be able to fulfill her destiny as any boy, dreaming that India retains its glory as spiritual leader of the world, dreaming that our enemies fear our strengths and respect our wisdom, dreaming every one live a life of dignity and be able to fulfil their aspirations and live a life of complete human being. He is going about his way, working day and night, with calm and composure, encouraging and motivating, making compromises with selfish men and women who are in power to take the country forward. He is human and is making mistakes, not for want of trying, taking risks to clean the system, both without and within his own party. But we have to prove ourselves deserving. We have to take the opportunity, grab the rope given to us to lift ourselves, to come out the deeply entrenched and corrupted system that is dividing the country in the name of the caste, region, religion only to grab your votes and then plunder the nation shamelessly not satisfied even after looting that will suffice many generations, caring only for vote banks leaving swathes of population, propping up their dynasties as if they are entitled to rule the lesser mortals of us. It is up to us. Oh Brother/ Sister, wake up!! A vote is the only way you can change your destiny for yourself and generations after you. Do not waste it away and chose wisely. He may go back to his way but we are the losers. If we lose this opportunity, we may go back half a century or more or worse, be irreversibly broken with little traces of the civilization that survived 10,000 years that was a beacon to the world and the only hope to unite the increasingly divided humanity. Brother, India is at the cusp of its destiny and history will judge us whether we seized the moment and took in the right path. No amount of regret will help after you vote unwisely just as no amount of water will quench the man after he died of thirst. Next articleICICI CBI charge sheet – could it have been filed sooner? 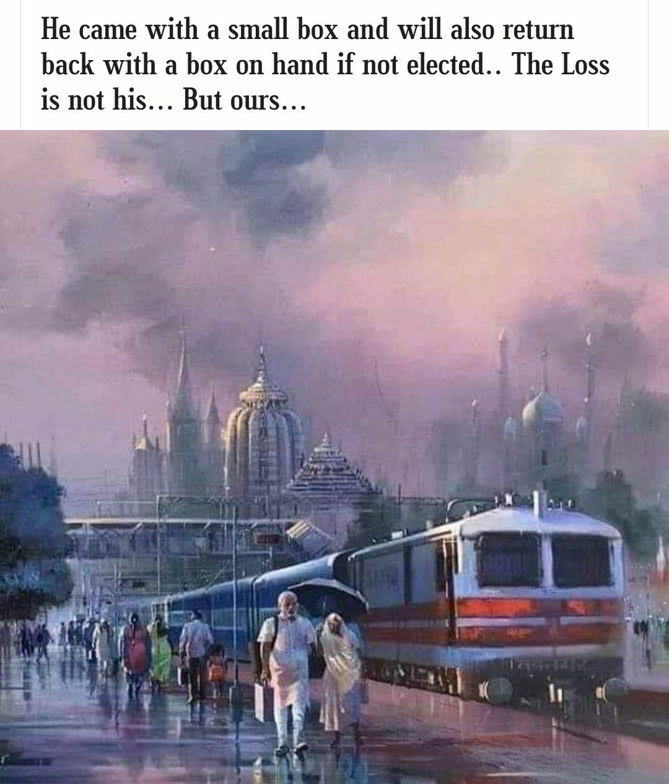 Hindus are lossers . Hindus lost winning spirit . To win you need unity . Every hindu is running for money which ultimatelly he loses as and when he dies . 1000 yrs of slavery and hindus leaders still not clear about their less and why they will lose in future again. To win you need a nation you dont have one . To win you need people ,you are letting your peoppe highjacked by enemy and you have no plans to stop. Conversion free and open of hindus . Our intellectuals have no good formula yet . Hindus were mere lucky to get Modi for 5 yrs . To get him for next 5 yrs they need to shade their blood, as enemy has plans they dont . I think it is too much to expect 70 years’ mud to be removed completely within 5 years what with both Lutyen’s media and some Babus being against him all the time – even today. Replacing Babus in cahoots with earlier dispensation from ministries would have probably seen a lot of additional court room cases. I admit about AJ being overloaded at times and other issues mentioned. All in all though he has taken several steps which could have been taken in 70 years but were not. In so far as corruption is concerned, while no closure has been achieved in majority of cases, it is partly due to judicial delays like in NH or C Company RJB cases. Besides, at least there is no further loot going on at the top levels in the government – that in itself leaves a lot of surplus with the government for social schemes for masses as well as for critical defense purchases deferred over the UPA decade because it did not yield desired commissions for its top brass. IN BRITISH ARMY 90 % OF SOLDIERS WERE HINDU , THESE WERE USED BT BRITISH TO RULE HINDUS . NOW ONCE AGAIN CONGRESS IS USING HINDU CONVERT TO ISLAM TO DESTROY HINDUS AND INDIA. OCE DIVIDED . TODAY WE SEE TWO HINDUS FIGHTING WITH ANOTHER HINDU FOR MUSLIMS RIGHTS. ONE BILLION HINDU WITH NO NATION AND ALL MISLEAD BY THEIR LEADERS ON SENSELESS ISSUE. CAN YOU IMAGINE HINDUS SUPPORTING RAHUL GANDHI AND EQUATING WITH MR MODI, RAHUL WHO HAS NO EXPERIENCE . Arjuna, who had care for every person in his heart, was not ready to fight a war against kauravas. Lord Krishna cleared his doubts. Today, there is no lord Krishna to guide us. Most of the soldiers are busy in celebrating ‘care for everyone’ as a virtue. It seems to me that a person who is totally sold to western values and western economics is running the country. If we continue on the same path, India is doomed regardless of election result. While one can ignore and give some room for “MODI-ARUN JAITLEY DUO” for NOT taking quick steps to bring back the black money stashed abroad by Indians, STALLING, DELAYING the Top Corruption Cases against Top NETAS as well as TOP Bureaucrats in the FM/CBI/ED/I-T, SEBI, RBI, Banks cannot be left lightly. This was well within their reach to accomplish but the Duo did “SIT IDLING for FIVE LONG YEARS.” They relied on the old-guards of UPA appointed Bureaucrats to run the Finance Ministry, a Key Portfolio, where they heavily BUNGLED on many fronts. Giving the too demanding, plum and key portfolios such as Defence, Finance, Banking, all put in the hands of AJ, was a grave mistake/ a wrong move by the Arrogant/overconfident and pompous Modi. would it be good to thrust all major work-load vested with a person who has major health issues? AJ as FM, also wears multiple hats including a huge family law firm EMPIRE to take care of, besides being an ACE member of the Delhi Lutyens Club, who cannot BUT hold great Admiration, MARVEL and succumb to extend his MORAL MITE to his Predecessor and Court Colleague Mr. C.., from the deep south to help him wiggle out of the trap? Finally, keeping away not only LK Advani, MMJ but many legal and finance experts like Ram Jethmalani, Arun Shourie, JS, Y. Sinha, Dr. SS out of the power structure and cabinet caucus/ambit was done by Modi- AJ Duo with the aim to get the fullest/complete control of the Delhi Central Administration “,to run it the way they wanted”. Taking everything in their hands, they failed at the implementation levels. It has not only created a deep divide within the BJP/RSS cadres but it will bring their downfall besides NOT fulfilling the goal of serving the Aam Admi. In the end, be it BJP/Congress or any other regional war lord who could gain the next Control of India, what Arun Shourie said long ago: “Power Corrupts, Absolutely Corrupts” holds true for the TOP stalwarts in the BJP/RSS Camps. AJ-Modi duo had their run for five years with tall talk and empty 2014 poll promises made, which is now coming to a miserable close with none fulfilled. “The proof of the pudding is in the eating”. Now, Karti C and Rahul Duo can soon get their power to go about tainting and maiming BJP and take their next turn so Aam Admi – the Common Citizens of India – Caught between the two Camps could remain EVER Clueless, Confused, in Constant Chaos, CONTROLLED & above ALL CHEATED!!!! Very nice… He came with a small box n will go with a small box…. Hmm… Did we educate Indians well enough to see what’s right and what’s wrong….all these years? And hence they , the missionaries succeeded in educating their faith to our little ones, made break-ins in security n judiciary (where once upper castes were the judges n were afraid of punishment from gods for wrong judgements) and divided Hindus with caste and languages…and NOW we getup from sleep and shout for help..